Penny just returned to the United States after spending two weeks surveying Save the Children's food crisis relief programs in Ethiopia. Little Haway from drought-parched Ethiopia had something special to celebrate on her first birthday – being alive. Her village, in what had been the dairy capitol of Ethiopia, has been devastated by drought. For two years, the rains haven’t come. Massive herds of goats and cows have been decimated. Almost nothing grows and fertile pastures are turning into deserts. Village children had nothing to eat but bark from the dying shrubs. 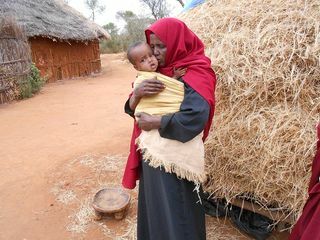 The drought took a significant toll on Haway’s village, her mother fell ill and couldn’t nurse her and there was no longer any milk to drink since the livestock had perished. Haway became dangerously malnourished and weighed only 12 pounds when she was brought to a Save the Children emergency nutrition program. She was skin and bones, extreme hunger and severe acute malnutrition consumed her tiny body. Like almost all children in drought-affected regions of Ethiopia, Haway also suffered from infections due to a lack of clean drinking water in her village. Infections hasten dangerous dehydration and muscle-wasting, forcing malnourished children into a rapid downward spiral. Once Haway became stable enough to digest protein and fat, she began receiving a weight-gaining mixture of milk, vitamins, minerals, grain, sugar and oil. And then she began to thrive. She went from listless to vibrant in just a few days. Her sunken face became full, eventually plumping up to the chubby-cheeked baby you see today. Haway became well enough to go home and begin the out-patient treatment program – consisting of high-nutrient, high-calorie foods and water purification supplies. The village matriarch, also named Haway, was astounded by the baby girl’s recovery. She has since become a health volunteer for Save the Children and has been trained to keep an eagle eye on health problems in her small tribal village. “I am happy to give back by being a health volunteer. If there were no Save the Children, many of the babies in my village would have died,” she says. With her entire village now involved with Save the Children’s health and nutrition programs, Haway and the other young children have the support and hope they need to make it until rains will come back. Learn more about our response to the food crisis in the Horn of Africa. Help Us Respond to the Food Crisis in the Horn of Africa. Please Donate Now.